If you were a registered rider last year in Tour de Guelph Five, you can use your same user name and login to register this year more easily. If you forgot your user name and password, you can retrieve those with your email by clicking the “Forgot your username or password" link below. Use your login information from last year’s ride to register this year! 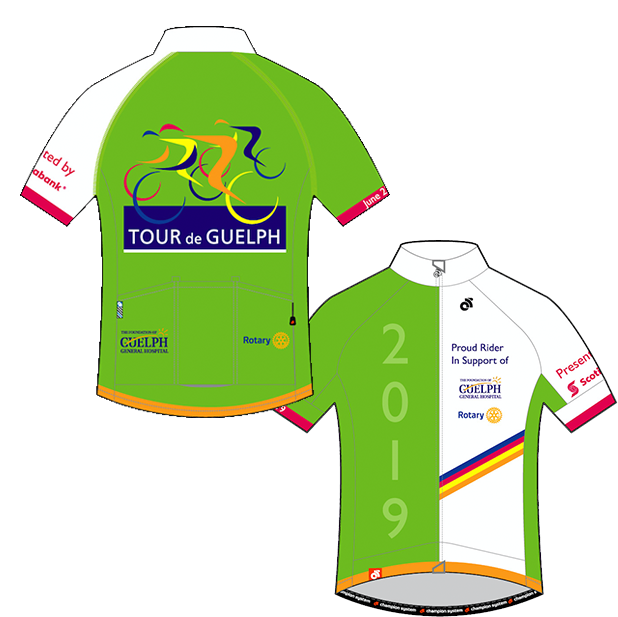 All registered riders to raise $300 or more will receive an exclusive Tour de Guelph 2019 cycling Jersey! Tour de Guelph is a cycling event in support of The Foundation of Guelph General Hospital and local Rotary projects through the Rotary clubs of Guelph South and Guelph Trillium. In it’s first five years, the event has raised over $300,000 for our community and has grown into one of Guelph-Wellington’s largest community sporting events. The ride continues to grow each year, now attracting close to 1,000 riders. Fundraise-to-Ride: When you agree to fundraise a minimum amount per rider, we will waive the registration fee for each registered rider! YES, you read that correctly! You can ride for free when you fundraise! Free-wheeler: As a Free-wheeler, you pay your registration fee at the time of registration and then you can decide whether or not to fundraise. If you choose to fundraise, you set your own goal and you have no obligation to meet your goal. When you register for Tour de Guelph, an online fundraising page will be automatically produced for you. You may use the email that you use at time of registration as well as the user name and password that you created to sign in to the fundraising portal. Use the online tools to help you reach your fundraising goals. The top three fundraisers will win a prize as well as the top youth fundraiser. Fixed Gear Brewery, our Fundraising Momentum Sponsor, will also have some surprises along the way! When you register, you have the option of registering as an individual or starting or joining a team. When you start or join a team, you will automatically be included in The Bike Shed Community Team Challenge. The challenge is to be the team that makes the BIGGEST impact in our community by raising the most funds. The winning team will win a team party hosted by The Bike Shed, Tour de Guelph’s official sponsor of The Community Team Challenge.